If you actively use twitter, you probably know that it’s common for tweets to have several hashtags. If you search for tweets with a particular hashtag, you often see other related hashtags repeating over and over again as certain topics trend together. If that information was distilled down to a single graphic that tells you what hashtags are frequently occurring together, you could easily get some quick insight about current related news or cultural items. The topic of today’s post will be making such a graphic. Step 1: Parsing the tweet. WOAH just saw #COSMOs #Science!!#physics. TwitterSearch will allow us to search with a hashtag. 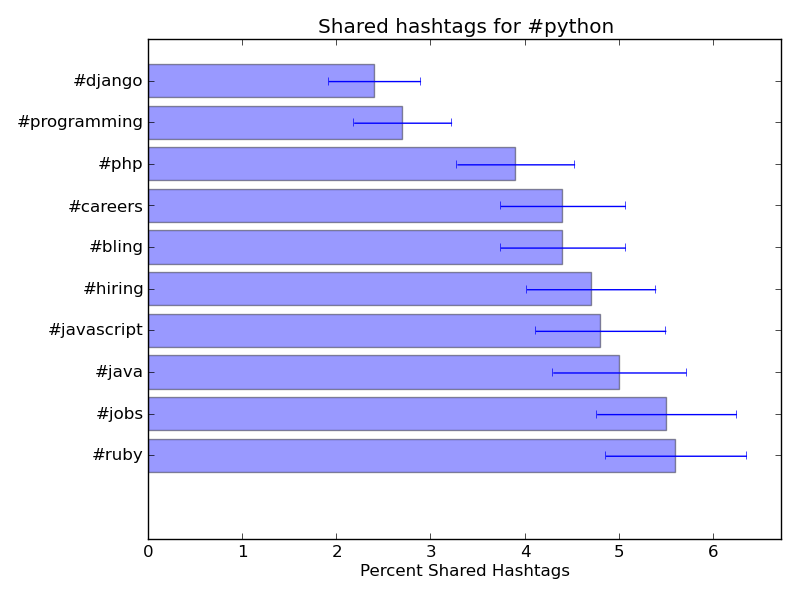 We want input a phrase like “python” and get back the frequencies of the top related hashtags in the last ~1000 tweets. To to do so you need to be a twitter developer to run the search, and you will need your own consumer/access keys and secret. See: https://dev.twitter.com/docs/auth/tokens-devtwittercom . # Loop over tweets in resutls. # Ignore our target hashtag! and get back a frequency list like: [[‘ruby’, 5.6, 0.7483314773547882], [‘jobs’, 5.5, 0.7416198487095663], [‘java’, 5.0, 0.7071067811865476] …. output of the HashSearch function. # insight from single-events. No mor ethan 10. # for the first N tweets. I’m going to put everything in a file called “Hashtagram.py” with a tag given as a command-line argument, and use just a couple lines to get the data and draw the histogram. # Now get the raw data for co-tags of the hashtag "mytag"
People talking about python are also talking about ruby, jobs, java, etc. People often tweet about biden and obama together, but it seems like most people care about his NCAA picks. For Russia, lots about ukraine and crimea, and still some lingering sochi from the olympics. For cosmos, some about actual cosmos, and some about the tv show. For boston, mostly about jobs and news. No twitter analytics is complete without a comprehensive yolo analysis. Swag is still a popular cultural item. There we have it. From international politics, to coding and the universe, we have found out what items are trending together in the aggregate mind of the internet. So that begs the question: What hashtags do you think would be insightful?